By moving the mouse onto the highlighted area on the map you can see its name and basic data, by clicking the mouse on it you can get the detail information. The Chejlava NNR was established in 1992, but the first protection of the forest growths above the village of Ždírec near Blovice date from 1925 and the locality was included among protected areas from 1933. The NNR lies in the parish of Měcholupy near Blovice in the Plzeňský kraj – Plzeň Region and covers an area of nearly 26 ha, approximately half way between the villages of Ždírec and Měcholupy at elevations of 538 – 616 m. The NNR covers the upper north-western slopes of Mt. Buková hora (651 m), where the main N-S ridge which falls towards the Úslava river valley, meets with the side ridge which runs to the east (south-east). The area has a mildly warm climate with mean annual temperatures of 7 – 8 ºC and a precipitation total of 550 – 600 mm. The subject of the protection is the old mixed deciduous forests (well-preserved and species-rich beechwoods) with a rich variety of grove flora in the undergrowth. The priority interest for nature conservation is to maintain and renew the old mixed deciduous forest growths and to gradually reduce and eliminate human intervention with the aim of attaining a self-regulatory regime in the forests. Chejlava NNR is also included in the Natura 2000 system as a proposed Site of Community Importance. The territory of Chejlava NNR and its surroundings are geologically a part of the Proterozoic of the Bohemian massif and are geomorphologically classified as belonging to the Bukovohorské vrchoviny hill country District, which belongs to the Radyňská vrchovina hill country Subunit and the Švihovská vrchovina hill country Unit. The basement is built of shales and greywackes of Proterozoic age, within which there are lydite intercalations. Lydite is predominantly present on the northern part of the territory and in a belt along the western boundary. Bouldery to blocky talus has formed around the lydite necks. The frost-riven cliffs of up to 10 m in height are of Periglacial origin and we can find rocky plateaux under them. Anthropogenic landforms can also be found on the NNR territory – the terrain shows evidence of surface mining such as remains of shafts and spoil tips which date from the prospection and mining of limonite. On the eastern edge of the NNR we can also see relief adjustments (agricultural scarps and stone collections) which prove that the area was used for agriculture. Tilio coradatae – Fagetum: growths with predominant beech (Fagus sylvatica) with an admix of large-leaved lime (Tilia platyphyllos) and sycamore (Acer pseudoplatanus) with an herb layer including dog’s mercury (Mercurialis perennis), coral toothwort (Dentaria bulbifera), sweet woodruff (Galium odoratum) and mezereon (Daphne mezereum). 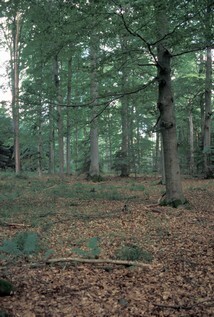 Festuco altissimae – Fagetum: herb-poor beech growths with Norway spruce (Picea abies) and wood fescue (Festuca alstissima) in the herb layer. 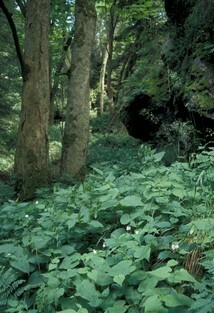 Small areas are covered with talus forest of the Mercuriali-Fraxinetum association with European ash (Fraxinus excelsior), dog’s mercury (Mercurialis perennis), wood millet (Milium effusum) and garlic mustard (Alliaria petiolata). 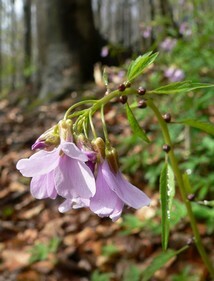 On the border of the NNR there are also small areas of spring area stands with alders of the Carici remotae – Fraxinetum association. 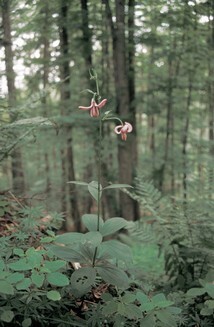 Rare plant species growing here also include martagon lily (Lilium martagon) and wolfsbane (Aconitum vulparia). A total of 211 animal species have been recorded on the NNR territory. The eastern edge of the territory is notably rich in molluscs. The Alpine newt (Triturus alpinus), viviparous lizard (Lacerta vivipara) and yellow-bellied toad (Bombina variegata) all live here. The large numbers of hollow trees provide nesting sites for many bird species including the long-eared owl (Asio otus), pygmy owl (Glaucidium passerinum) and the eagle owl (Bubo bubo). 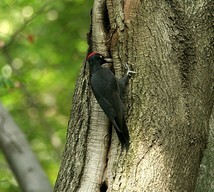 Other significant bird species include black stork (Ciconia nigra), stock dove (Columba oenas), black woodpecker (Dryocopus martius) and the nutcracker (Nucifraga caryocatactes). Mammals on the territory include the western hedgehog (Erinaceus europaeus) and the pygmy shrew (Sorex minutus). The first historical records of the Zelená hora forests dates from the time of the division of the extensive Zelená hora estates after the deaths of Adam and Ladislav from Šternberk in 1560 and 1583. In 1560, the Chejlava forests were recommended for further usage for production of building materials and the manufacture of shingles. As shingles were most commonly cut from fir and spruce, sometimes pine and only in a few regions from beech and oak timber we can estimate the species composition of the Zelená hora forests at that time. Other historical evidence tells of the development of iron production between 1650 and 1740 in Bohemia, and includes the Zelená hora forests. At that time surface iron ore (limonite) was certainly extracted on the territory of Chejlava NNR, and we can still see evidence of pits and spoil heaps today. Iron ore extraction and working used up large quantities of timber and large areas of forest were felled. From the description of the Zelená hora estate from 1708, the forests were mostly mixed, with main species pine, oak, beech, fir and spruce. The spruces, which were documented in the 1780s, were probably the result of attempts to increase the productivity of wood production. The legal inventory of the Zelená hora estates after the death of Count Jeroným Colloredo–Mansfeld in 1922 still describe extensive areas of beech forest. In the Chejlava forest complex the species composition also included larger numbers of silver fir (Abies alba) and fewer Norway spruce (Picea abies). By 1859 the species composition in the whole Chejlava forest section was completely modified and of the total area of 752.60 ha, 135 ha were of pine and 615 ha were of spruce. So even 150 years ago the natural deciduous species made up less than 1 % of the forest cover. From the mid 20th century the territory of Chejlava NNR was removed from the Zelená hora estate’s commercial forestry plan and most of the territory was deliberately left uncut. When we also consider the current protection of the reserve, the forests have not been used commercially since the Second World War.